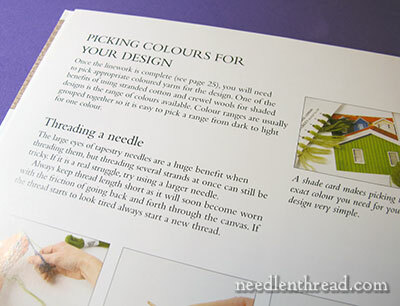 The Royal School of Needlework and Search Press have published a series of Essential Stitch Guides for different needlework disciplines. 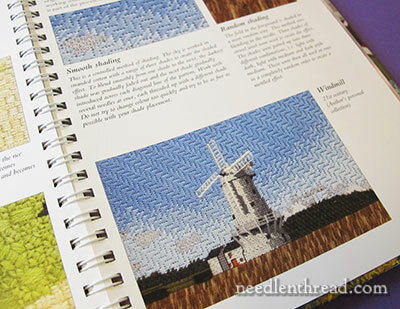 These are very handy reference books to have in your needlework library. They cover the basics and a little beyond in each technique, giving the beginner a place to start and a direction to move in when learning various aspects of the needle arts. 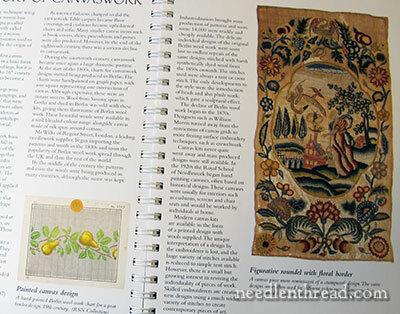 So far, eight Essential Stitch Guides are available on the following needlework techniques: Crewelwork, Blackwork, Whitework, Silk Shading, Stumpwork, Goldwork, Bead Embroidery, and Canvaswork. I’ve reviewed seven of them (the links above will take you directly to my previous reviews), and today, I’m reviewing the eighth – the RSN Essential Stitch Guide for Canvaswork, by Rachel Doyle. Canvas work and needlepoint are synonymous terms. Here in the US, needlepoint has been the more commonly used term for stitching on canvas, though more and more, the term “canvas work” is becoming more widely used here, too. Like the other books in the series, the RSN Essential Stitch Guide for Canvaswork is a compact, spiral bound book, the perfect size for tucking into a work bag, and easy to open flat on a table, for optimal learning situations. Every time I get my paws on the next Stitch Guide (I have no idea how many are planned – anyone? ), I renew my appreciation for their binding decisions on these books. It’s a cased-in binding, so that the spiral is covered with a spine, making the books easy to identify on the shelf. When using an instructional book, it is so very nice to have a book that lays flat on the table before you, rather than one that constantly wants to close. The book begins with an introduction to the Royal School of Needlework, and then moves on with a brief history of canvas work. This part of the text is short, but readable. It doesn’t really go into modern canvas work beyond the early 1900’s, besides saying that there’s a small revival of individuality in canvas work today. 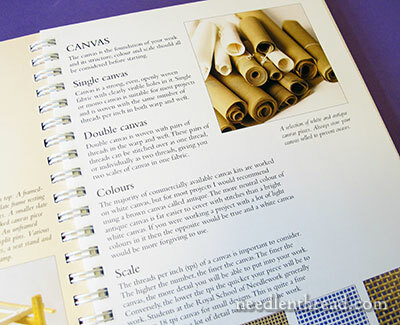 From there, we move into a discussion of materials used in canvas work, and there’s a concise explanation of canvases in general, with photos of samples to help you discern which type is which. For the modern canvas worker, there are more colors available for needlepoint canvas these days, beyond the white and the natural (or “antique”) colored canvases mentioned here. 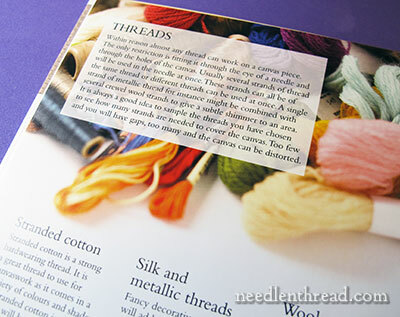 You’ll also find a brief discussion on threads for canvas work. The standards are listed. Again, there are many other choices out there today as far as specialty threads go, that are used in modern canvas work techniques. As with all the RSN stitch guides, you’ll find clear information on how to set up canvas on a slate frame and also in a hoop. In the UK, the slate frame is more popular than it is here in the US, and apparently much more widely used. In the US, for needlepoint especially, the stretcher bar frame is the more popular frame choice. It’s less expensive, much easier to find, much more user friendly, and much easier to set up. If you’re just starting out in canvas work, don’t think that you can only use a slate frame or a hoop. Stretcher bars are an excellent option for canvas work, and I was a little surprised they weren’t mentioned at all. Scroll frames also work well for canvas work, so that’s another option available. I’m not really sold on the hoop approach, myself. I think a hoop for canvas work is probably a stretch (no pun intended!). If you use a hoop with canvas work, the design must fit inside the hoop area, which requires you to use a significantly larger piece of canvas than necessary, in order for the canvas to fit in the hoop. It works, but I wouldn’t rank it as a primary choice for canvas work. All that being said, the normal approach at the RSN is the slate frame and the hoop. So that’s pretty much what’s addressed in every RSN stitch guide. Just so you know, though, there are other options. After materials, we move into the question of design. This is a wonderful section of the book! It greatly clarifies the process of choosing a design suitable for interpretation with thread on canvas. 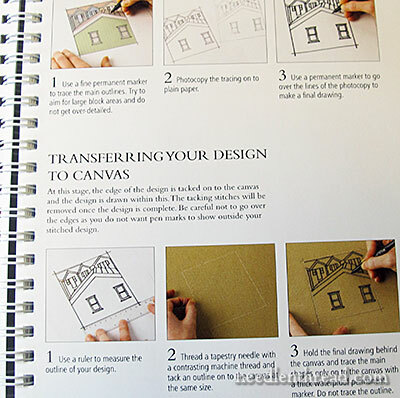 If you enjoy canvas work, but you’ve only stitched someone else’s designs because you weren’t sure how to go about designing your own canvas, you’ll find this section very useful. After deciding on a design, there’s the question of getting that design onto your canvas – and that’s covered in detail, too. 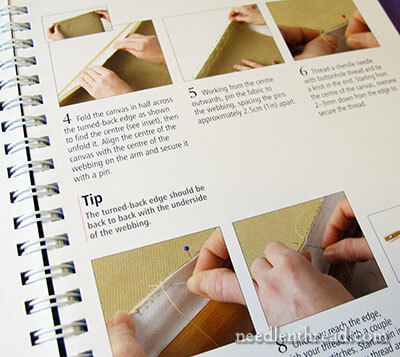 …along with instruction on how to start stitching on canvas. There’s good information on sampling stitches – checking to make sure that your stitch choice and your thread choice work well together to cover the canvas completely without cramming. 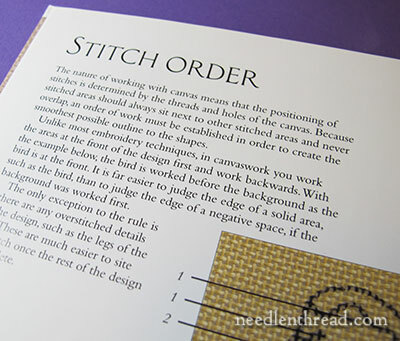 The stitch order in canvas work is slightly different from the stitch order in most surface embroidery techniques, so there’s a section devoted to explaining the order of stitching. 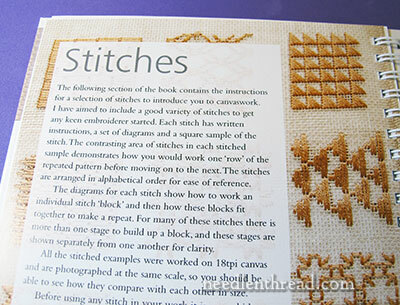 The bulk of the book, though, is dedicated to stitches used in canvas work. There are lots of stitches that can be used on needlepoint canvas, and a good many are covered here. The stitches are arranged in alphabetical order, and they include a clear stitch diagram, along with a stitched sample in two colors so that you can see what the stitch looks like on canvas. There’s also usually a photo of a larger piece incorporating the stitch, which is a very nice addition. It’s great to see specific stitches used in various applications. When it comes to the arrangement of the stitches in the book, I understand the reason for an alphabetical listing, but I did pause and contemplate the arrangement from the point of view of the beginner. Through the eyes of an absolute beginner, I think I would find that launching straight into a stitch dictionary with a variety of more complex canvas stitches a little overwhelming. It doesn’t really give you a starting point. 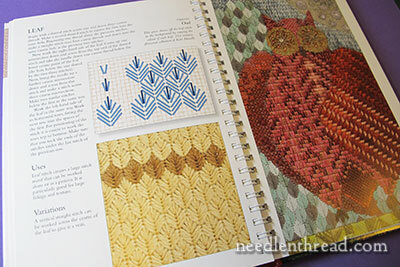 This is why I hesitate here: If the book is meant to help the absolute beginner, it would make more sense in my mind to begin with the common, typical, straightforward stitches of canvas work, and then to work up to the more complex stitches and combinations. For example, I expected to see tent stitch first. Now, you might cry out, “Tent stitch? But everyone knows how to do tent stitch! Tent stitch is boring! Tent stitch is so common!” But if the point of the book is to get the beginner started, the beginner might not know tent stitch. The beginner is a beginner, after all. While I love the variety of stitches presented here, and I love the way they are presented, I was a little surprised that the beginner wasn’t led into the more complex stitches from the simpler, straightforward stitches of canvas work, like tent stitch, Gobelin stitch, and the like. Still, there’s a nice variety of interesting stitches here. It’s not an exhaustive list, but it’s a good list, and the stitches are presented very well, with a clear chart and examples. …and a little bit on shading. 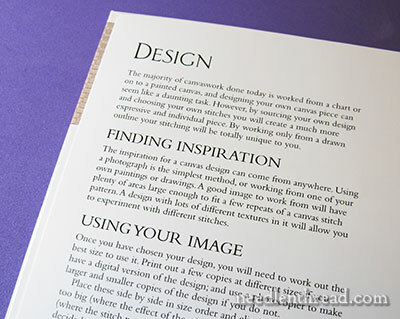 There’s just enough on those pages to whet the appetite and prod you to further learning and development in canvas work. 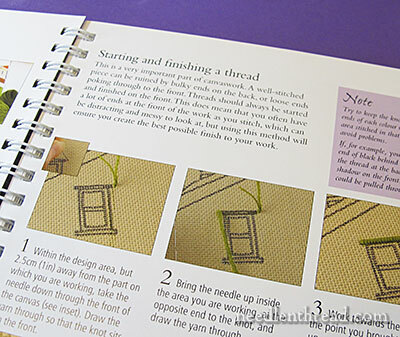 Overall, I think The RSN Essential Stitch Guide: Canvaswork is a good addition to the needleworker’s library, especially if you’ve dabbled a little bit with basic canvas work, and especially if you are keen to collect the complete set of RSN stitch guides. The book is reasonably priced and contains enough information and inspiration to prod the beginner to further exploration. 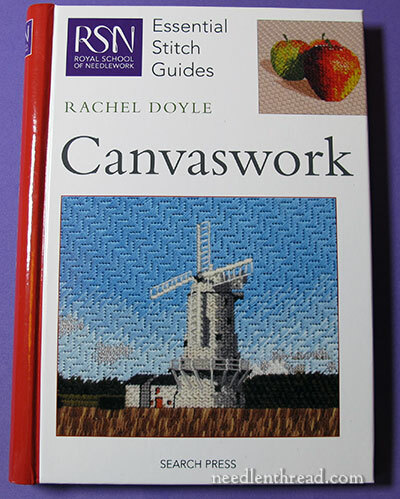 In the US, RSN Essential Stitch Guide: Canvaswork is available through Amazon. Worldwide, check The Book Depository for the RSN Canvaswork Stitch Guide, where they offer free shipping to many countries around the world. 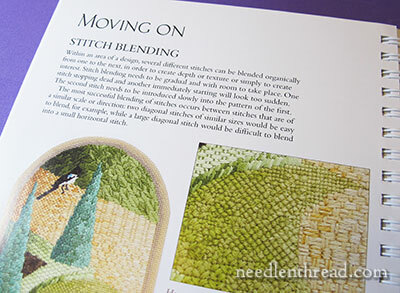 I do like the RSN Essential Stitch Guides I have the Bead Embroidery book and it’s handy in showing different techniques in beading. 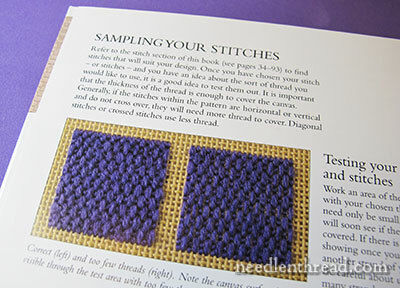 I find these books give a flavour for further research in a particular sewing technique. Thanks for reviewing the book and sharing your views on it. First off: I agree that a hoop wouldn’t be a great choice for canvas work. But I didn’t see Q Snaps mentioned. Wonder if the canvas would be too stiff for those. Second: I understand tent stitch may be the most basic stitch but I still can’t keep it straight from the other stitch, looks like a half cross but is called something else. Is it Continental? You can tell I don’t know anything about canvas work. Third: my biggest problem with doing needlepoint is knowing where a color starts and stops. They say hand painted canvases are much easier to follow but I’m not sure about that. My few attempts at needlepoint were a disaster so I’m missing something along the way. Thank you so much for the review, Mrs. Corbet! So using the rating system on your Books page (https://www.needlenthread.com/books-links), how many stars would you give this book? I always enjoy reading your posts! I learn something new each time!!! Just like going to school but I don’t have to leave my chair!! Thanks for sharing so much with us! Thanks for the review. My daughter is a beginner just getting into needlepoint via kits. She does not know the tent stitch. I will be teaching her some basics when I visit her next. What is a good reference book for beginners? Every time I see a blog post from you about a book I know I might as well not bother reading the review and should just cut right to the chase and add it to my ever-expanding wish list. You’ve done it again!